The 85 m2 apartment offers a cosy atmosphere. In the well-equipped kitchen you will find a cosy corner for eating, evening card games or for entertainment. Of course, we have satellite TV and radio in this area. And a sunny bedroom for 2 people and a crib and of course, also a modern bathroom with WC. On the upper floor you will find the large, colourful children's room with bunk bed & a lot of toys for rainy days, next to this is a cuddly room w/a large bed. Main and shoulder season prices can be found on our home page. The prices include final cleaning! In the laundry room you will find a washing machine and a dryer (each € 2.50 per usage). For internet access, we charge a fee of € 3.00 per day. Wireless DSL access via wlan is also available. 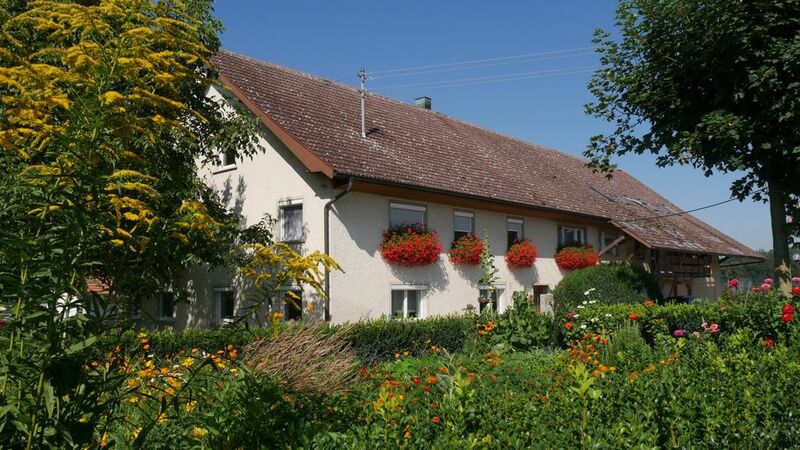 Arrive, move in, relax: Enjoy undisturbed days on our family-friendly farm in Ailingen, in the middle of the three country corner at the stunningly beautiful Lake Constance! During the day, you can get sun on our terrace, dream in the hammock, at evening you can eat & celebrate together at the grill. 3 large holiday apartments w/stunning view will be a home for you - for relaxation, as a starting point for excursions & for a lot of great experiences. Children are born explorers. There is a lot to discover by us: a playground with trampoline, swing & sandbox, a go cart, multiple rollers, pedal tractors w/accessories & a wagon. Don't forget our pets: At our hamlet, geese play and our dog Django is very nice to children & the goats Babsi and Krümel wait to be pet. Highlights: It is very peaceful here and child-friendly. We have small pets. The distance to the beach is about 4.5 km. We spent two weeks here and couldn't have been happier. The owners Bernadette and her husband Alfred are such a lovely couple that went out of their way to make us welcome. The apartment was very clean and the appliances and furniture were all of very good quality. The property is extremely family friendly and the kids room was full of toys and puzzles, in addition to a large games room downstairs with fussball, ping pong, sandpit toys, boardgames, go carts and so on. The outside area has a large sandpit and trampoline as well as an excellent BBQ area and some hammocks under the trees. There is a very picturesque walk into the local village that takes about 20 mins up through the apple orchard and over a hill with an amazing panorama. The area is superb for family activities like fun parks, water parks, swimming in the lake, thermal baths and so on. In two weeks we barely saw half of the things we wanted to. We even drove down to Switzerland via Austria for the day. Be sure to visit the tourist office in Ailingen, they are incredibly helpful and will give you all sorts of vouchers, loan you equipment and so on. Will definitely be returning here, couldn't recommend it more. Beautiful Setting and Perfect Host Family! What a great place and a great host family. The setting is beautiful and the family has been so great! The first night we got here, they took us on a sled ride with their tractor. Since then they have helped with EVERYTHING. Germany has a new snow tire law and we were not prepared. They have found tires and in installer for us and allowed us to stay an extra two days even though it makes it short on cleaning time for them. This morning the grandfather even drove us into town for supplies. Kindness combined with beauty! We enjoyed our first stay in Ailingen so much we returned again last year. The apartments are bright,airy,well equipped, spotlessly clean and well maintained.The farm is blessed with a fabulous location set amid cherry trees and endless fruit fields.It has a lovely rural feel to it and yet you are just minutes away from all amenities.The host family are very friendly, welcoming and helpful and nothing was too much trouble. All in all we would defy anyone to come here and not fall in love with the place:-)The general area is amazing with Switzerland only a short boat ride away and Austria a quick spin down the road.Its a little piece of heaven. Unser schönster Urlaub mit den Kindern! Empfehlung für Familien mit Kindern! Hier werden sich eure Kinder wohl fühlen! Da es keine Straße weit und breit vorhanden ist, können die Kinder frei herumlaufen und spaß haben, ohne, dass wir Eltern uns sorgen machen müssen! Wir waren als vierköpfige Familie das erste Mal auf dem Höhlerhof. Alles war genau so wie beschrieben, wenn nicht sogar besser. Die Wohnungen sind sauber und gepflegt, sehr geräumig und gemütlich. Die Familie Schraff war wirklich sehr nett!!! Tischtennis, Grillabende, Lesestunden in der Hängematte, Ziegen streicheln und versorgen, Trampolin hüpfen, Django knuddeln, eine lustige Äpflefahrt und eine gratis Trommelvorführung waren inklusive. Von dem Hof aus kann man die beliebtesten Ziele am Bodensee sehr gut erreichen. Besonders empfehlenswert ist ein abendlicher Spaziergang zu der kleinen Kapelle, dort kann man verweilen und über das Tal blicken. Alles in allem ein super schöner Sommerurlaub, wir haben uns sehr wohl und gut aufgehoben gefühlt! ferien@hoehlerhof is located on the Haldenberg. A small elevation above Ailingen. With good weather, we can see the Swiss Alps in Austria over to Bavaria. From here, you can go hiking, cycling, relaxing or just enjoy the tranquillity. at Lake Constance. The Ravensburger play land is nearby. Speak to us or send us an email. Preise Hauptsaison 01.05.-30.09. 85 €/2 Erwachsene 15 € pro weitere Person ab 16 Jahren 7 € pro Kind von 1-16 Jahren Nebensaison 10.02.-30.04 Nebensaison 01.10.-31.12. 75 €/2 Erwachsene 15 € pro weitere Person ab 16 Jahren 7 € pro Kind von 1-16 Jahren Mindestaufenthalt: 4 Nächte Bei Kurzaufenthalten unter 7 Tagen wird eine Pauschale von 50 € erhoben. Die Preise verstehen sich inkl. Endreinigung. Mindestaufenthalt im Juli und August: 14 Tage ( Sommerferien ) In den Osterferien, Pfingstferien und Herbstferien vermieten wir nur wochenweise.